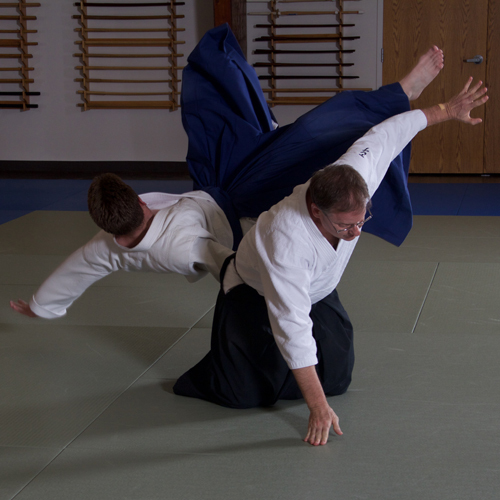 Adult Program: Aikido in Fredericksburg offers twenty classes each week for adults, so you should be able to participate regardless of your work schedule. Youth Program: Aikido provides children with a noncompetitive athletic activity, and teaches many lessons beyond self-defense. Aikido fosters self-esteem, confidence, discipline, patience, respect, courage, and perseverance without aggression. Specials Youth Class: This once-a-week class is structured for special needs youth such as those with autism or Down syndrome. Seniors Program: Aikido can be practiced by senior citizens and others with varying mobility. We offer a once-a-week class via Stafford County Parks & Recreation to senior citizens, and many seniors also participate in the regular classes at the Dojo. Uchideshi Program: The Uchideshi (“inside student”) program at Aikido in Fredericksburg is an intensive residential apprenticeship for students wishing for a traditional immersion experience in Aikido. It is based on the program at the Iwama Dojo in Japan, where O-Sensei developed Aikido. Seminars: Two to four times a year, Aikido in Fredericksburg hosts seminars with visiting instructors selected from among the best in the world. Kyudo: “The Way of the Bow” is the elegant method of drawing and shooting the traditional Japanese longbow. Participants will practice a variety of postures and movements, and learn how to draw the bow and shoot it with emphasis on technique. Yoga: Relaxed, supported movements and postures release blocked energy and refresh both mind and body. We also offer individual instruction, weapons training, instructor training, and intensive classes. Click here to schedule a free trial class.